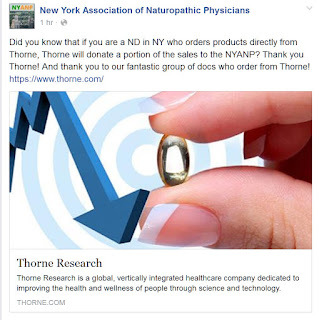 naturocrit: Funding New York ND Licensure Through Thorne Supplements Ordered by NDs! Funding New York ND Licensure Through Thorne Supplements Ordered by NDs! here, a screen capture of a NYANP post on Facebook that reveals how they're raising money to get NDs licensed in New York. RECIPROCATION!